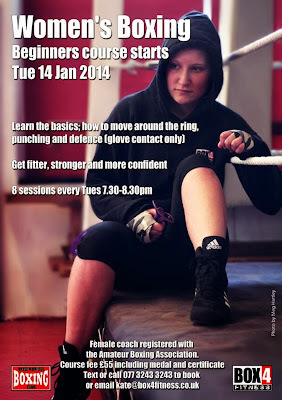 Box 4 Fitness, Hebden Bridge Boxing Club: Start 2014 with a BOOM! Start 2014 with a BOOM! The first women's beginners boxing course starts January 14, 2014 at 7.30pm. An 8 week course, certified by the ABA, led by a female coach, in an all-female environment. Teaching you the basics of boxing, a few rules and body conditioning exercises for boxers. It's suitable for anyone over 15yrs, is non contact and does not require a high standard of fitness to begin with. Boxing training is particularly useful for increasing confidence in women, chanelling agression in a positive way and unloading stress. The cost of the course is £55 which includes a medal and certificate upon passing the assessment. Places limited to 14 and booking is essential. Email kate@box4fitness.co.uk or text 077 3243 3243.